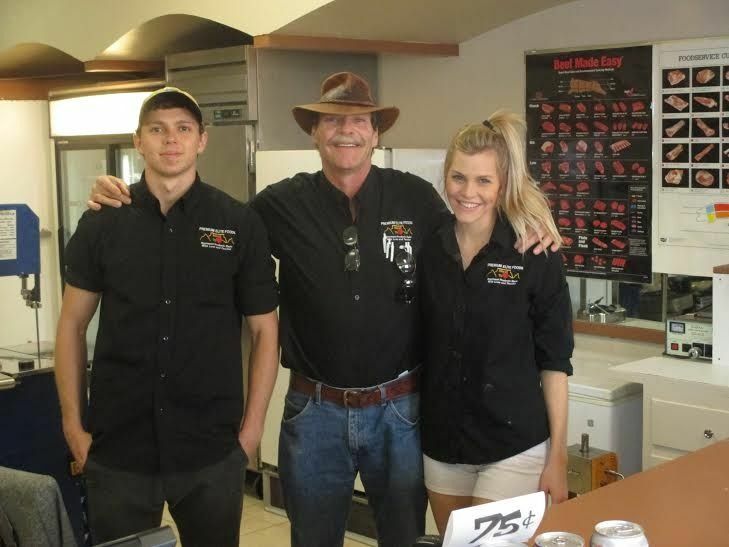 Buck Buchanon and his family have come a long way to find a home in Latonia where they have set up their meat shop and butchery called Premium Elite Foods on Decoursey Avenue. Buck is from South Africa where he went to agriculture college and specialized in bovine genetics. With that knowledge, he now makes high-protein meats that he sells in bulk and off of the grill. Buchanon pays close attention to the genetic selection criteria based on tenderness, marbling, shear force, age, breed and leanness of meat. The combination of these traits produce the highest protein of choice prime cuts. He says that certain industries have already latched onto his meats like gyms, diabetics and people on dialysis. "Because apart from the butchery, we do everything here. We also do protein beef slices and protein beef sticks. Those are my best sellers, those two products. The reason is the slices are 30 percent protein, the beef sticks are 28 percent protein and there are zero carbs on both. So my number one market for that is gyms. Crossfit Gym comes and cleans me out. They take everything I can produce here," he said. Buchanon visited Northern Kentucky last September when he came to see his brother who lives here and he liked what he saw. Providing local families with nutritious meats at reasonable prices quickly became a passion for him and he went to work to open up his shop. "Some have told me that I'm going overboard, but I don't think so because that's what you're tasting. When you want something, you want something real. You want something homemade and you want it at a high protein. You don't want leftovers from last night, which other places do," Buchanon said. His meats are treated with care having been marinated for days before being sold to customers. He offers a variety of chicken, beef, and pork cuts and seasons them with his own spices. "All my hamburger patties and spices are what gives me the high scores here because of my flavor, and what gives me an edge over any product is that the chicken and pork are marinated for 72 hours. My baby back ribs are marinated for 48 hours. You look at a large grocery warehouse, they receive their steak frozen for who knows how long. They put it on display and they push it back and forth, I don't do that here. It's a total difference in quality." While his meat packages sold to households are his primary business driver, the meats he serves off of the grill at the shop are a big hit in the neighborhood. Not only does it serve individual meals, the grillables also serve as samples for people who buy meats that they store at home. "The grilling is the second segment to the business," he said. "The reason I do that is because people can flavor the quality that we do, because unlike any other place, there are only six hands that handle the meat: myself, my son Graham and my daughter Cammy." The operation is truly a family affair with Graham in charge of production and Cammy in charge of marketing while Buck fills in the rest. In addition to his meats, he also takes pride in the chili he serves. Inside the store, customers can fill out score cards that rate how they like the products there. Almost every score card posted gives Premium Elite Foods perfect scores for meat selections and also highly rate the chili. "That's authentic chili. I don't do what they do by throwing beans in and chocolates and cinnamon, because that's a gimmick. That's a game," he said. "To make this chili, you get up at four in the morning and there's no ifs or buts. I must admit that there have been a few days that I've missed because it's just too hectic. It doesn't happen often." Buchanon and his family are involved with local churches and also partner with The Colony retirement community to help the elderly when they can. They face the same challenges all small-business owners do by battling the larger box stores. Also, Buchanon hopes that individuals and families take the time to further consider the nutritional value of the foods they put into their bodies. "The second disturbing thing is that people don't care what they eat, they just look at price. So regardless of protein level or carb-protein ratio that is totally out of whack, they buy it just because it's cheaper and that is sad. Take a bite of a high-protein dish at the same price and taste the difference. That's why I'm against fried foods." Premium Elite Foods is closed on Mondays for production so that the family can prepare the meats and the chili for the upcoming week, but is open the other six days of the week. Buchanon offers a free dinner to anyone that purchases $100 of meat at a time, including whole racks of baby back ribs. "Dinner is on me. Where does a family on a budget get a 22 percent discount?And that's from my family to theirs. I didn't increase my prices to do that. My prices are extremely competitive," he said. Although the high-protein beef products get the bulk of the attention, customers have shown that his chicken dishes rank highly as well. "Everybody complains when I am out of chicken. Many people say that they're all chickened out, and what do I have? Then they taste it and it takes them to a whole new level." Buchanon will even store the purchased foods at his store for families that have limited freezer space at home. "I'm helping them. It's already paid for so whenever they need it, they can just come and collect," he said. Premium Elite Foods already sells its products to the Silver Leaf bar down the street and has dabbled in the catering market, but Buchanon says that he would like to get the business more established before venturing out too far. "It's coming. It is coming."